Whether it's a black-tie reception or casual gathering, of all the wedding traditions, the wedding reception dance is often the most meaningful and special. Many couples enjoy their first dance together, dedicating one song to their special moment on the dance floor. But many couples also choose to honor their relationship with their parents with a dedicated song. The original father-daughter has been expanded to include the mother and her son so that the mother of the groom has her moment in the sun as well. 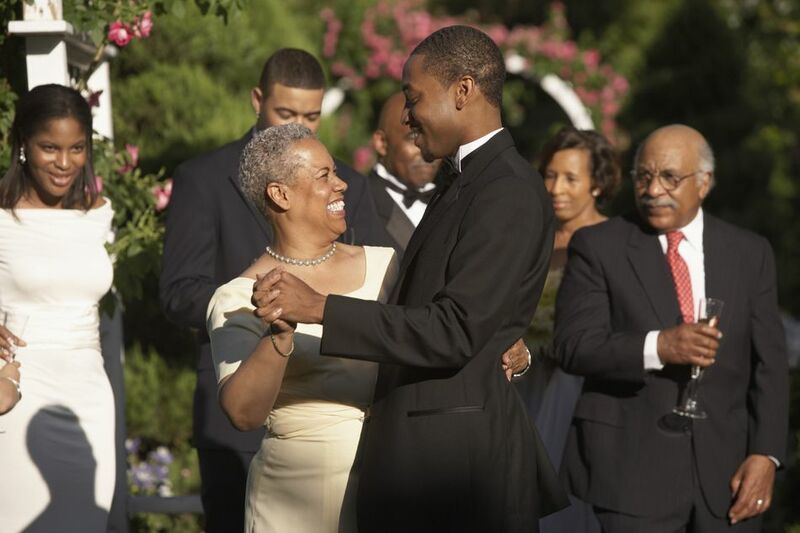 The mother-son dance is often one of the most tender and touching moments of the wedding reception, and care should be taken to select the right mother-son reception song. Whether the family or an event planner is making the selection, sentimental lyrics and a slow tempo are key so the groom and his mother can enjoy and savor the moment. Sweet songs that capture the emotion of the mother-son dance are personal, but the tunes below offer something for everyone whether your taste veers toward R&B or country. Dixie Chicks: "Godspeed (Sweet Dreams)"
No mother can make it through this song with dry eyes. The Dixie Chicks bring it home in this emotional tune filled with references to childhood including "Goodnight Moon" and Superman. This tune is nostalgic and familiar to nearly everyone. Roberta Flack: "The First Time Ever I Saw Your Face"
While originally written by Ewan MacColl for his soon-to-be wife, Roberta Flack's' version is slower and much more sentimental. The song has versions performed by other music greats, including Johnny Mathis, Celine Dion, and Mel Torme, so there's a lot to choose from. This gentle melody has lyrics that are sweet without being overly sappy and is a wonderful choice for many mothers and sons. Lee Ann Womack: "I Hope You Dance"
This song became a popular choice for mother-son dances circa 2000-2001 when it netted various awards in the country music industry. It remains a popular choice today because the lyrics perfectly describe a mother's wishes for her son as he grows. Jason Mraz: "The Rainbow Connection"
Nearly everyone is familiar with Kermit the Frog's 1979 classic from "The Muppet Movie" and many grooms will recall singing this hit with their moms. While many artists have covered the song, Mraz's gentle version is among the best.